News - DNG Maxwell Heaslip Leonard - Francis Street, Galway. MASSIVE INTEREST WITH SOMETHING FOR EVERYONE IN DNG MAXWELL HEASLIP & LEONARDS SEPTEMBER AUCTIONS. The Radisson Blu Hotel is the place to be Friday afternoon with DNG Maxwell Heaslip & Leoanrds eagerly awaited September Auction finally here. Following on from a hugely successful July auction which saw a 98% sales rates, the Auction team are very excited about tomorrows event and are, as usual, expecting a large turnout. As per usual auctioneer James Heaslip will be heading up proceedings and is anticipating a busy afternoon, with 20 lots going to the Auction floor. The Galway city based firm are looking to continue their unrivalled sales rate and have an eclectic mix of properties covering the whole of the West coast. James comments “We pride ourselves on our success rate on the auction floor. The whole team works really hard for every auction and we treat every property the same, giving each lot the same care and attention we feel every property deserves. We always get satisfaction when all our efforts come to fruition on auction day”. James is keen to stress that the companys’ success is ultimately down to knowledge of the market, “We put a lot of resources into our auctions, working with our DNG colleagues all along the west coast, and it pays off – our clients are very happy and we all get a sense of achievement at the end of a long but successful day!” With over 20 lots coming to the Auction floor, properties include both Commercial and Residential units and are dispersed throughout Galway city and county, Mayo, Leitrim, Roscommon and Clare. The Open Viewings are now complete and its just down to the day to see what levels each of the properties will sell for. James finally adds “We have some great value on offer tomorrow and would urge those who have viewed any of the lots to make an effort to come along. Even if you don’t end up being a sucessful bidder, theres always great entertainment on show and we will even give you a cup of tea and a biccy, so its never a wasted afternoon!” Full details of all the auction properties, can be found online at www.dnggalway.ie. APT 8 BALLYBANE NEIGHBORHOOD VILLAGE , BALLYBANE, GALWAY. APT 5 BALLYBANE NEIGHBORHOOD VILLAGE , BALLYBANE, GALWAY. DNG MAXWELL HEASLIP & LEONARD SIZZLING SUMMER AUCTION DRAWS CLOSE! Well in the throws of open viewings, contract requests and enquiries regarding Auction Day, the offices of leading local agents, DNG Maxwell Heaslip & Leonard are a hive of activity, in what promises to be an exciting and busy Auction day. This weekend will see the final Saturday of open viewings on Auction properties, rounding up what has been a busy Auction run for the DNG team. “This Saturday, 22nd July, will be the final Saturday of open viewings so it’s usually a busy one”, according to Alan Maxwell, MRICS, MSCSI, although we will continue to view the properties on Wednesdays open viewing schedule and by appointment.” He goes on to add “It’s not unusual for people to see the properties for the first time Auction week, however usually the emphasis shifts to contracts at this time. We provide an online Dataroom where prospective purchasers can download the legal packs for each property. Purchasers can request access to the Dataroom by logging onto dnggalway.ie/auction and clicking on the ‘LEGAL DOCUMENTS’ button located on the property they are interested in. Our auction team are busy responding to all document requests this week”. This 3 bed semi-detached house is located in the heart of Tirellan Heights and in walk in condition. Built in the mid 1970s, this property has been modernised recently and is presented in excellent condition and ready to immediate living. Located with all amenities on the doorstep to include, Tirellan NS, crèche, city bus service running through estate, Menlo Park Hotel, Dunnes Stores Headford SC, and only 20 minute walk to city & NUIG, This property will make an ideal starter home. It comprises of an entrance hall, sitting room, kitchen/dining room, bathroom, 3 bedrooms with master ensuite & one bedroom on the ground floor, plus a rear block built shed, patio and side entrance. Spacious two bedroom first floor apartment, within a small exclusive development of three apartments only. Maunsells' Court exudes character and presence, and was constructed at a time when spaciousness of accommodation took precedence. Nestling on a partially elevated site, the entrance is approached via sweeping steps, with well tended gardens to both front and rear, whilst parking and private storage sheds are to the rear of the development. Without doubt, a fantastic opportunity to acquire a city property within an area where properties seldom come to the market, and are highly sought after. A three bedroom semi-detached property located just off the main Ballybane Road, which comprises c.947ft² of living space and requires some minor refurbishments. Adjacent to all amenities and within walking distance of GMIT and the major employment hub on the East side of the city, this property presents a wonderful investment opportunity or indeed a potential starter home. An outstanding detached bungalow residence adjacent to Cregmore Cross on the outskirts of Galway city. Comprising almost 1,235 ft², this recently refurbished family residence is in pristine condition, with all mod cons, and should appeal to those seeking a starter home in walk-in condition. On a site of 0.35 acres, the house has mature Gardens and is being sold with a large detached garage. Cregmore National School is just metres away and Galway city if just fifteen minute from your front door. Located just a short walk from Galway City Centre this end terrace property has been fully modernised and is a perfect starter home or investment opportunity. With four bedrooms including a large ground floor en-suite and 95 m². of living space everything is in pristine walk in condition. Coole Park affords a very accessible location that is sure to appeal to city dwellers. The property is owner occupied. Located opposite the main entrance to Ashford Castle this beautiful dormer home overlooks a serenic woodland setting beside the world famous village of Cong. Appropriately named, The Tree Tops stands on a mature site of 0.7 acres which has been meticulously looked after and includes extensive shrubbery, lawn and a wild garden. With 110 m² living space this home is perfect for a growing family or would be an ideal bolt hole away from it all but within easy reach of many amenities including Lough Corrib. Recently, completely renovated, detached 4 bedroom house comprises c. 1720 ft² of bright spacious living accommodation and boasts a B Energy Rating and a south-west facing rear aspect - this allowing natural light to flow through the house and its extensive gardens from morning to evening. Ground floor accommodation comprises a large kitchen/dining room, spacious living room with natural gas fire, downstairs wc, fitted office and separate utility room, in addition to solid walnut and tiled flooring throughout. First floor accommodation comprises four bedrooms, with main ensuite and the main family bathroom, which includes the added indulgence of a Jacuzzi type bath with power shower. An Cheathrú Rua or Carraroe is in the heart of south Connemara Gaeltacht and is a thriving hub of activity and tourism just 37 km west of Galway City. This property with 60m² of living space has previously been used as a children's creche but is perfectly positioned on the village edge to provide a superb opportunity to provide a starter home or a holiday residence in this beautiful part of the world. Standing on c 0.35 acres the property is serviced by mains sewer and all other services and has no doubt great potential for re-development. A large five-bedroom period residence close to the centre of Oughterard Village. On a wonderful site of over one acre, the mature gardens have over 400 ft of river bank frontage on to the Owenriff River. Comprising c.325m² of living space, the house is in need of refurbishment but has the benefit of Full Planning Permission to renovate and extend, to include a detached garage. The site is also zoned residential which may lend itself to further development subject to planning. Within walking distance to all amenities and just 30 minutes from Galway City Centre. A well located premises in the centre of Gort Town. The building is divided into ground floor retail space (with tenants in situ) and first & second floor residential space (vacant). In need of upgrading, the building is in a most prominent location fronting on to both the Square and on to the N66 (Crowe Street) Galway Limerick Road. Comprising approximately 200m² over the three floors, the property has excellent potential and will appeal to those seeking a good investment in a busy market town. This four bedroom demi detached private dwelling located close to Tuam town centre. Accommodation comprises of kitchen/dining, living room, utility, w.c., four bedrooms and a bathroom. Property enjoys a spacious garden to the rear. A detached bungalow residence positioned in the heart of Loughrea town within easy access of schools, shops, Loughrea Cathedral and the Lake. With 95m sq of living space this is would make a superb investment or townhouse home. Occupied until recently this house is in walk in condition and has been well maintained. Quality built 3 bed end of terrace house, located in the village centre of Claregalway with all amenities on the doorstep including National School, New secondary School, Church, Supervalu & all amenities. Ideally located within ease of access of Galway City, many surrounding business estates and a central point of access to Tuam, Roscommon and Mayo. The home includes a sitting room with open fireplace, kitchen/dining room, wc-whb on the ground floor, with three bedroom, master ensuite & main bathroom on the first floor. Cuirt Na hAbhainn is a high quality residential development built on a magnificent site in the heart of Claregalway Village. Ideally located within ease of access of Galway City, many surrounding business estates and the central point of access to Tuam, Roscommon and Mayo. With excellent internal and external specifications this three bed mid-terraced house, comprising c.1,057ft² is a superb property, and would make an ideal home for a first time buyer. High quality residential development built in the heart of Claregalway Village. Ideally located within ease of access of Galway City, many business parks surrounding Galway city and a central point of access to Tuam, Roscommon and Mayo. With excellent internal and external specifications this three bed mid-terraced house, comprising c.1057 ft² is a superb property, and would make an ideal home for a first time buyer. A detached three bedroom bungalow residence in need of refurbishment, with a former cottage to the rear, in Carraroe, Co. Galway. Set on a large site of approximately 1.2 acres, the house and outbuilding are suitable for development, with an existing septic tank in place. The main house comprises 850sq.ft of living space and offers huge potential to both those seeking a well located holiday home, or an owner occupier looking for a family residence with room for further expansion. Located close to the Village adjacent to all amenities in a scenic location. A well located commercial premises in the centre of Gort town. Adjacent to AIB overlooking the town Square, this three storey property comprises approximately 430sq.mtrs to include a ground floor retail unit and a basement which was formerly in use as a licensed premises. The first and second floor have recently been partially renovated and are suitable for residential usage. An ideal opportunity to acquire an impressive building in the towns’ most high profile location. Wonderful riverside apartment, c.673 ft², located on Dominick Street, in the heart of Galway City Centre. Directly adjacent to all amenities on offer, this location along with the area known as “The West” has evolved in recent years to form an eclectic mixture of food, entertainment and cultural establishments. Comprises a spacious open plan living/dining kitchen with stunning views of the passing canal, two bedrooms and a main bathroom. This courtyard development is nestled by the river, away from the bustle of the street yet a short walk from everything. Rental values in this area are excellent. A mid terrace two-storey residence in the centre of the City’s West End on Sea Road. Although habitable, the house is in need of considerable renovation. This well located property is being sold with the benefit of a large south facing rear garden which lends itself to further development. Fronting onto the Small Crane, all amenities are close to hand with the centre, just a stroll away. This is a ground floor 2 bed apt located in the town centre will all amenities on the doorstep. This ground floor apartment comprises an entrance hall, sitting room, kitchen, bathroom, two bedrooms and includes electric storage heating. Substantial 4 bed detached property, c. 1,556 ft², in a small development of only 16 detached homes in the much sought after location of Snipe Lawn. Adjacent to all amenities, to include many local schools and shopping centres, the property is also only a two minute walk of NUIG & UCHG and within a ten minute walk of the city centre with the added bonus of a regular bus service on its doorstep. The property over-looks a green area and boasts a large private rear garden with adjoining garage in addition to off street parking to the front. Quality three bed ground floor apartment, c. 92m², in the popular Dun na Coiribe development. Ideally located adjacent to Dunnes Stores Headford Road and within walking distance of the city centre. Includes electric storage heating, ample communal parking, patio area and master bedroom is ensuite. It is currently owner occupied and is being sold with vacant possession. This 3 bed semi-detached house is part of a small residential development on the outskirts of Tuam town. The house requires substantial works however this may appeal to the investor or someone that would relish the idea of doing up a house from scratch. This is a three bed semi-detached dormer bungalow residence with c. 900 ft²of living space to include three bedrooms, kitchen, sitting room and main bathroom. Part of a small housing development, this residence is located in the village of Monivea approx. 30 min from Galway city. Substantial 5 bed detached property, located on the N17, within close proximity to Corofin, Tuam, Claregalway and Galway city & close to all amenities. Includes a sitting room, lounge, kitchen, utility, two bedrooms with one ensuite and a bathroom all on the ground floor, with three bedrooms, a bathroom and two further rooms all on the first floor. There is also a large shed attached to the gable of the property. A mid terrace residence in need of total renovation in the centre of the most picturesque village of Clifden Connemara. This cottage is a very short walk from the market square and has easy access to all that the area offers in terms of Connemara national Park, beaches and a host of facilities. Being offered to reflect the works required this property is a first class opportunity that should not be missed. This is a one bedroom apartment with bathroom, open plan living/kitchen/dining area with balcony. The property is in good condition. The property is located in a development of residential apartments and a small element of commercial activity at ground floor level. As it is so close to the town centre, there are abundance of amenities close by. A ground floor commercial retail unit for sale in a most prominent location on the corner of Mary Street/Francis Street in the centre of Galway city. Comprising c. 40m²at ground floor level with a basement storage area of the same size. Within a short walk to Shop Streetand adjacent to Eglington Street. Eight residential units in a purpose build development in the town of Castlerea, Co. Roscommon. Built in 2005, the units are being sold with vacant possession and are in need or renovation/decorative works. Being sold in one lot the sale includes 4 x two bed apartments; 2 x three bed apartments and 2 x 3 bed townhouses. This is a traditional style bungalow which is in need of some modernisation or has possibilities as a redevelopment opportunity. Standing on a site of c 0.4 acre this property which is in the middle of Furbo Village fronts onto the main R337 road 12km west of Galway City. It is just moments walk from the beautiful Furbo Beach, local national school and is positioned on the Sea side of the with sea views over Galway Bay. With a slight, but noticeable lengthening in daylight, and as we draw a close on the 1st month of 2017, the Auction team at DNG Maxwell Heaslip & Leonard are once again gearing up for a busy Auction season, which kicks off with their Spring Auction on Thursday the 2nd March. “Last year was another great year for us at Auction” says James Heaslip MIPAV, Director of Auctions, “We continued our excellent sales record and we hope and expect similar success this year”. He goes on to add “there is still great value to be had at auction and people are still keen to buy. As always, we are launching this, our first auction of 2017, having spent considerable time preparing each property for market – our Auction team are well over their Christmas rest and have been working busily behind the scenes to prepare.” The Spring Auction features properties spanning from Donegal to Clare with properties in Galway city & county, Co Donegal, Roscommon, Leitrim and Clare. 2.9 Acres of Agricultural Land, located in the townland of Castlegar, on the outskirts of Galway city. All Enquiries to DNG Maxwell Heaslip & Leonard 091 565261. A detached four bedroom house situated along the main road on c 0.1 Hectares. There is fencing to surround the gravel plot to the rear with a tin roof out shed. The property is in need of complete refurbishment and redecoration throughout. The property is located in a rural area c. five minutes to the nearest village of Cloghan and 25 minutes to the nearest town Ballybofey. Enquiries to: DNG Boyce Gallagher 074 916 8608. Next Auction takes place on Fri 23rd Sept 2016 in the Radisson Blu Hotel, Lough Atalia at 3pm. DNG MAXWELL HEASLIP & LEONARDS JULY AUCTION HAS VARIETY AND QUALITY. This week sees the West of Ireland’s leading property experts DNG Maxwell Heaslip & Leonard launch the final Auction in their Summer series of Auctions, to be held in the Radisson Blu Hotel on Thursday 21st July. The Galway city based firm have been leading the way recently, with their most recent Auction in June providing a remarkable 95% sales success rate – the highest anywhere in the country. A four bedroom semi-detached residence comprising approximately 100 m² of living space in one of the most sought after locations in Galway city. In need of modernisation, this outstanding property is situated opposite the walls of NUIG and within a short walk of UHG. Ideally suited for extending, the house is on a large site with a west facing rear aspect with ample room for development. A wonderful opportunity to acquire a home with huge potential close to all amenities. Guide Price: €395,000. A well-presented four bedroom mid terraced residence over three floors in the much sought after "Leac Linn" development in Barna Village. Comprising approximately 1,500 ft² of living space and finished to a high specification, this property is being offered to the market with under floor heating, PVC Windows, solid wood floors, doors, skirting and extensive tiling. Within a short stroll to Barna Village centre and all amenities. Guide Price: €250,000. Located fronting onto the Knocknacarra Rd, 'Shindilla' is a substantial detached residence of 255m², which is in need of refurbishment. Standing on an elevated 0.25 acre site the property affords an opportunity to redevelop into a modern family home that is conveniently located close to schools, shops, Salthill promenade and Galway Golf Club. Set back from the road and complimented by the mature neighborhood, the expectation would be to either renovate the existing property, or undertake more substantial building work to develop this home. Guide Price: €370,000. This family occupied home is on a beautiful mature site of c. 725m² fronting onto Renmore Rd Galway. With 120m² of living space this bungalow boasts a lovely open feel with open plan living areas. In addition to the four bedrooms, there's is an added bonus of an adjoining granny flat that would easily generate extra income or extra living space. A short walk from playing fields, schools and with the City easily accessible. Guide Price: €380,000. 4 Amarillo Court, Dublin Rd, Tuam. A Two Bedroom Semi Detached residence with a small entrance hall, kitchen/sitting room with open fireplace, bathroom and two bedrooms. The kitchen units are complete and a tiled back splash, the bathroom is fully tiled, the sitting room includes a fitted fireplace and the house complete with semi solid flooring throughout. Amarillo Court is a small private estate of only five units located off Dublin Road, across from Tuam Rugby Club and within walking distance of Tuam town centre. Guide Price: €64,500. 6 Aengus House, Dock Road, Galway. A wonderful first floor apartment in the O'Malley Built Aengus House development on Galway Docks. Comprising 650sq.ft of living space, this well laid out apartment has beautiful views over the Docks and Galway Bay. Within a short stroll of Galway's famous Latin Quarter & city centre shopping. Ready to walk into to include a private parking space. Part of a fully managed secure development. Guide Price: €250,000. An outstanding five bed det residence in the much sought after development of Oranhill in Oranmore. Both bright and spacious, the house is finished to a high standard, has over 2,200 ft² of living space with solid wood floors, extensive tiling and is being sold with the benefit of a south facing rear garden. There is private off street parking and all amenities are close by. Galway city is just ten minutes drive away. A three bedroom semi-det property situated on a corner site in a quiet cul de sac in the Cois na hAbhainn estate. Located on the Ballygaddy Road approximately 2 minutes from Tuam Town Centre and adjacent to all local amenities. This bright spacious property includes a large kitchen/dining room and utility with patio doors to rear garden. First floor accommodation comprises of three bedrooms with master ensuite and a main bathroom. DNG Maxwell Heaslip & Leonards Auction will take place on Thursday the 21st July at 3.00pm in The Radisson Blu Hotel, Lough Atalia, Galway. Full details of each property can be viewed on www.dnggalway.ie or by contacting any of the Auction Team at 091 565261. 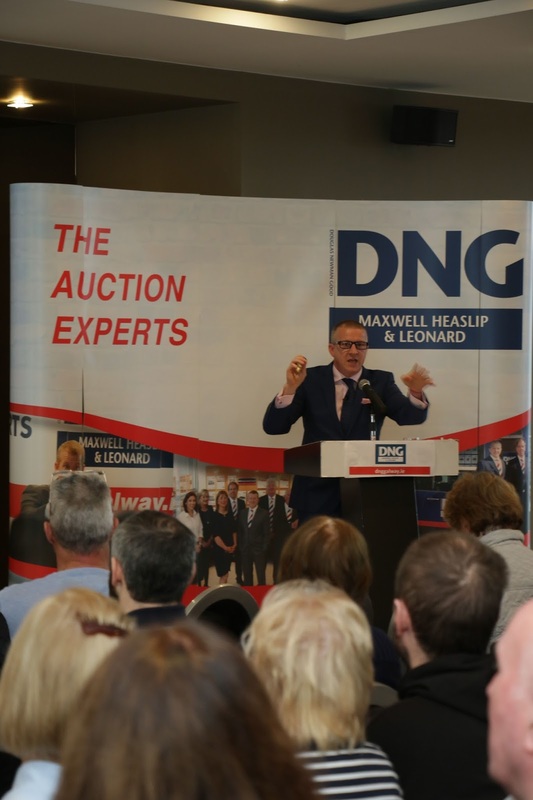 DNG Maxwell Heaslip & Leonard are pleased to announce details of their upcoming June Auction, the first in their series of Summer 2016 Auctions, taking place on June 9th in the Radisson Blu Hotel, Lough Atalia at 3pm. The Auction features 21 lots throughout Connacht in Galway City & County, Sligo, Mayo and also featuring property in Ennis Co. Clare. Next Auction to take place on Friday 29th April 2016 in the Radisson Blu Hotel, Lough Atalia. 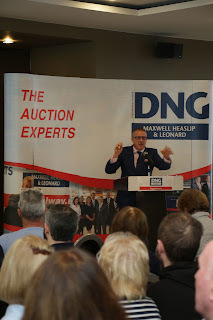 DNG MAXWELL HEASLIP & LEONARD – FEB AUCTION UP & RUNNING..! DNG Maxwell Heaslip & Leonard’s first auction of 2016 takes place on 26th February 2016 in the Radisson Hotel, Lough Atalia and as usual, will be streamed live online on dnggalway.ie; dng.ie and galwayadvertiser.ie. “In our first auction of the year we will feature a range a properties throughout Galway city and county, Clare & Mayo”, says Fergal Leonard MIPAV. He goes on to add “the advantage of the auction process is the finality & surety it offers to both vendors and buyers. We run a 5-6 week auction campaign where all properties receive high media exposure both online and in local & national print media. We run a schedule of open viewings and private viewings as dictated by the needs of individual properties and come auction day, all bases have been covered to give every property the best chance on the auction floor”. Also commenting on the Auction, Auctioneer, James Heaslip MIPAV, remarked “We starting our year off with a 15 lot auction with something to suit a range of buyers – first time buyers, investors and those looking to upgrade with some excellent value to be had”. A three bedroom duplex townhouse apartment in the much sought after private residential development known as Lios Ealtan at Nile Lodge. Comprising c.95m² of living space, this bright and spacious residence is being sold in excellent condition, with a west facing rear terrace and private secure parking, Just a short stroll from the city centre, this outstanding unit offers excellent rental yield and is a prime investment for those seeking value for money in a top class location. The solicitor with carriage of sale is Ms Colette Neville, Ronan Daly Jermyn Solicitors, 2 Park Place, Citygate Park, Mahon, Co. Cork. Tel: 021 4802700. The AMV is €235,000 and open viewings are on Saturdays from 3.30pm – 4.30pm. An exceptional two bedroom duplex apartment in a secure private development just of the Clybaun Road. In excellent condition, this spacious property is being sold ready to walk into, with wood floors, extensive tiling and private parking. Part of a gated estate, the unit is within walking distance of all amenities and offers easy accessibility to Galway City Centre. Ideal for those seeking a private residence or a top class investment property. The Solicitor with carriage of sale is Ms Jennifer O'Shea, Matheson Solicitors, 70 Sir John Rogerson's Quay, Dublin 2. Tel: (01) 232 2000. The AMV is €130,000 and open viewings will take place on Wednesdays and Saturdays from 2pm – 3pm. A two bedroom ground floor apartment in walk-in condition located in the development of Frenchpark. This apartment is circa 722 sq ft and includes laminate flooring, fully tiled bathroom and ensuite. There is also rear access from both bedrooms to a rear communal garden. There is parking to front of the apartment and also to the side. It is located within a 4 minute walk to the popular Village of Oranmore, and is just off the main roads that service Galway City, Dublin, Limerick and Shannon. The solicitor with carriage of sale is Mr Greg Nolan, Greg Nolan Solicitors, 5 Sherwood Avenue, Galway. Tel: 091 582942. The AMV is €79,000 and viewings are by appointment. THE AUCTIONS TAKE PLACE ON FRI 26th FEBRUARY IN THE RADISSON BLU HOTEL, LOUGH ATALIA at 3pm. FULL DETAILS ON dnggalway.ie or by contacting DNG Maxwell Heaslip & Leonard on 091 565261. MONEARMORE, COSMONA, LOUGHREA, CO. GALWAY. A detached two-storey residence on a private site within a short walk of the town centre, the house is in need of major refurbishment but offers huge potential for those seeking to build a family residence or develop the site for other purposes. Adjacent to the N65 roundabout, offering easy access to and from Loughrea Town. Solicitor with carriage of sale: Mr. Colman Ryan, C/O Ryan Solicitors, 1 Fitzwilliam Street Upper, Dublin 2. The AMV is €90,000 and viewings are by appointment. An elevated site circa 8 acres, with full planning permission for a detached residence of 324m². Planning permission granted Jan 2011 with extension of time granted in Jan 2016, until 18 Jan 2021. Planning reference is 15/1407 and it comes with a local housing need or returning immigrant clause. This site has unspoilt views over Lough Corrib and while rural, there are a number neighbouring houses. Located in the townland of Tonabrocky, all amenities are nearby to include Glenlo Abbey, schools, Rahoon/Newcastle GAA, Westside Shopping Centre (Dunnes Stores) only 3km away. The solicitor with carriage of sale: Ms Una O'Donnell, John C O'Donnell & Sons Solicitors, First Floor, 15 Mary Street, Galway. Tel: 091 561128/9. The AMV is €195,000. Beautiful family home, c. 1,975 ft² of living space on a site of circa 0.4 acres close to Claregalway & Oranmore villages, with nearby access to the M6 Motorway. Includes extensive tiling throughout, solid oak doors, PVC double glazed windows, fitted kitchen with Belfast sink. Rear garage fitted as a home office. Close to schools, hotels, supermarkets, and sports clubs. The solicitor with carriage of sale: Ms Eva Macken, Baily Homan Smyth McVeigh Solicitors, 7 Harcourt Terrace, Dublin 2. Tel: (01) 440 8300. The AMV is €180,000 and open viewings take place on Saturdays from 11am - 12 noon. Located in the centre of Ballinasloe town close to all the amenities, this c.75m² apartment is one of four on the 1st floor over a commercial unit, with own entrance to rear. There are three bedrooms, two double and one single, a kitchen/living area and a bathroom. The solicitor with carriage of sale: Mr Peadar Brown, McDowell Purcell Solicitors, The Capel Building, Mary's Abbey, Dublin 7. Tel: (01) 828 0600. The AMV is €18,000 and there will be an open viewing tomorrow Fri 5th Feb.
Three bed apartment, c. 900 ft², part of a student complex conveniently located on the Old Cratloe Road only a short walk from LIT, incl. hall, open plan kitchen/dining room/living room, 3 bedrooms (2 ensuite) bathroom & toilet. Built c. 2004. Thomond Village Student accommodation comprising 190 unit in a pooled rental scheme. Solicitor with carriage of sale: Mr Paul O'Mahony, Edward O'Mahony & Co Solicitors, 22 Tuckey Street, Cork. Tel: 021 4273886. The AMV is €25,000 and there will be an open viewing tomorrow, Friday 5th February 2016 at 12 noon until 12.30 pm. Three bed apartment, c. 900 ft², part of a student complex conveniently located on the Old Cratloe Road only a short walk from LIT, incl. hall, open plan kitchen/dining room/living room, 3 bedrooms (2 ensuite) bathroom & toilet. Built c. 2004. Thomond Village Student accommodation comprising 190 unit in a pooled rental scheme. Solicitor with carriage of sale: Mr Paul O'Mahony, Edward O'Mahony & Co Solicitors, 22 Tuckey Street, Cork. Tel: 021 4273886. The AMV is €25,000 and there will be an open viewing Friday 5th February 2016 at 12 noon until 12.30 pm. A two storey mid-terrace house three bedroom house in need of renovation. The property originally consisted of living room, kitchen, parlour, three large bedrooms, store and bathroom. Large gardens with off street parking. Ideal investment project with excellent rental potential. Located just off town centre close to all amenities. The solicitor with carriage of sale: Ms. Elizabeth Hegarty, Kane Tuohy Solicitors, The Malt House North, Grand Canal Quay, Dublin 2. Tel: (01) 672 2233 The AMV is €12,000 and viewings are by appointment with DNG Michael Boland 096 76557. This generously sized holiday cottage (semi-detached)is c. 119m² and is located in the popular holiday village of Doolin, Co. Clare. Accommodation includes reception, kitchen/dining, utility, GFWC, 3 bedrooms (1 ensuite), main bathroom. In reasonably good condition, is suitable for short term holiday lets with small garden to rear. Ms Louise Gannon, Mason Hayes & Curran Solicitors, South Bank House, Barrow Street, Dublin 4. Tel (01) 614 5000. The AMV is €80,000 and viewings are by appointment with DNG O'Sullivan Hurley on 065 6840200. A four bedroom semi-detached residence in an excellent location on the Lwr Salthill Road. Within a short walk to Galway city centre, this well presented property is in good condition has been extended to allow for approximately 160sq.mtrs of living space. Being sold with an elevated rear garden, on street parking with all amenities close to hand. The solicitor with carriage of sale is Ms Catherine O'Grady, Joynt & Crawford Solicitors, 8 Anglesea Street, Dublin 2. Tel: 01 6770335. The AMV is €170,000 and viewings are by appointment. The property comprises a single storey, semi-detached building, with a converted attic space. The building dates back to the early 1920’s and has been redeveloped and modernised over recent years. It is of stone and concrete construction with a pitched tiled roof and is connected to the mains water and sewage. Currently in use as commercial premises, the property is let to multiple users and generates a gross rental income in the region of €1800 p.m. Close to all amenities and within a ten minute walk to the city centre. The solicitor with carriage of sale is Ms Catherine O'Grady, Joynt & Crawford Solicitors, 8 Anglesea Street, Dublin 2. Tel: 01 6770335. The AMV is €180,000 and viewings are by appointment. We are pleased to offer this superb two bed apartment to the market. Located in the much sought after area of Galway docks, this wonderfully finished 4th floor property is finished to an extremely high standard and offers outstanding views over the city. A short walk from to Eyre Square and all of the city’s amenities. Part of a fully managed development, with private secure parking space. The solicitor with carriage of sale is Ms Elizabeth Hegarty, Kane Tuohy Solicitors, The Malt House North, Grand Canal Quay, Dublin 2. Tel: (01) 672 2233. The AMV is €170,000 and viewings are by appointment. A ground floor three bedroom apartment in the much sought after Gleann Na Ri development on the east side of Galway city. Part of a modern purpose built estate, this fully managed complex is currently part of a pooled scheme and offers excellent rental yield. Finished to an exceptional standard, this spacious 750 ft² unit is in turnkey condition. Being sold to include all appliances and furniture. The solicitor with carriage of sale is Ms Jennifer O'Shea, Matheson Solicitors, 70 Sir John Rogerson's Quay, Dublin 2. Tel: (01) 232 2000. The AMV is €95,000 and viewings are by appointment. The Auctions take place on Friday 26th Feb 2016 at The Radisson Blu Hotel, Lough Atalia at 3pm. 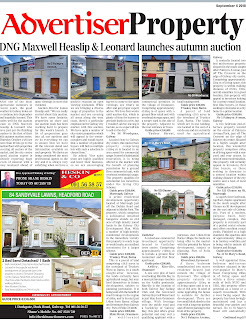 DNG Maxwell Heaslip & Leonard will host their final auctions of 2015 on Friday 27th November 2015. The auctions will be held in the Radisson Blu Hotel, Lough Atalia at the earlier time of 2pm. The auction team will bring 36 lots to the auction floor with a range of properties appealing to investors, first time buyers and those seeking to trade up. After a well-earned break the Auction team at DNG Maxwell Heaslip & Leonard are this week gearing up to launch their September auctions, the penultimate of their Auction Diary for 2015. Following on from the success of their June & July Auctions, the local leading agents are excited about what again looks to be an interesting mix of properties with something to interest owner occupiers, first time buyers and investors, both residential and commercial. According to James Heaslip MIPAV, MCEI, “demand is high for properties – we have more demand than supply at the moment. There is a huge shortage of rental properties in Galway at the moment so it’s a great opportunity for investors to acquire some really good investment properties”. As usual the Auction team will hold Open Viewings for the next four weeks in the lead up to the auction. Heaslip continues “we start our blitz of advertising and open viewings this week with a four week intense campaign. Our open viewings take place on Wednesdays and Saturdays when people can come at their leisure to inspect the properties”. Beautiful detached dwelling located in the very popular village of Claregalway on the outskirts of Galway City, ideally located within fast access of Galway, business estates and the central point to get to Tuam, Roscommon and Mayo. The house itself comprises of 4 Bedrooms (master ensuite), bathroom, kitchen, dining room, living room, utility and guest toilet. Solicitor with carriage of sale: Ms Ruth Sheridan, William Fry Solicitors, Fitzwilton House, Wilton Place, Dublin 2. Tel: 01 6395000 and the AMV is €180,000. This is a 3 bed semi-detached house with the benefit of full planning permission to build a 2nd house alongside. Planning permission was granted in July 2015 and allows for a 3 bed house circa 103 m² in place of the current single storey side extension. The current house consists of 3 bedrooms and a bathroom on the first floor with a large sitting room, kitchen/dining room and bedroom on the ground floor. It has a south facing rear aspect. The solicitor with carriage of sale is Mr John Glynn, Patrick Hogan & Co Solicitors, Dunlo Street, Ballinasloe, Co Galway. Tel: (090) 964 2110. Open viewings will take place on Wed & Sat 11.00am - 12.00 noon. The AMV is €145,000. A four bedroom semi-det house, located in one of the most sought after areas in Salthill, just a short walk from Schools, Salthill promenade and the City centre. With 140 m² of existing living space, this property comes with the benefit of full planning permission to extend to c.260 m², to include an attic conversion. The west facing rear garden is best positioned to take advantage of the afternoon and evening sun and the front will easily accommodate two car park spaces. This is a rare ready to go development opportunity to create a magnificent family home in a premium location. The solicitor with carriage of sale is Mr Mark Killilea, Purdy Fitzgerald Solicitors, Kiltartan House, Forster Street, Galway. Tel: 091 565765. Open viewings shall take place on Wednesdays & Saturdays from 3.30pm - 4.30pm. The AMV is €395,000. A well-presented detached dormer style residence on the outskirts of the much sought after location of Clarinbridge Village. Comprising approximately 230 m² of living space, this well maintained family home is on a mature site of 0.4 acres and is set off the road offering total seclusion and privacy. Being sold with a many features, the property has a large rear galvinised shed and is within a short walk to the Village centre. An ideal opportunity to acquire a superb family home in a top class location. The solicitor with carriage of sale is Mr Colm Mc Eoin, Mc Eoin Solicitors, Main Street, Clarinbridge, Co Galway. Tel: 091 776384. Open Viewings take place on Wednesdays & Saturdays 3.30pm - 4.30pm and the AMV is €250,000. Opportunity to acquire a four bedroom detached bungalow residence located at Cloongowla, Ballinrobe. The property sits on a site of approximately 0.32 of an acre, extends to approximately 1,152 ft² in size and is located approximately 1 mile from Ballinrobe Town. The property is in need of some moderate repairs but has the following features:- TV room with open solid fuel fireplace, fully fitted kitchen (in need of upgrading), double glazed windows and doors, built in wardrobe in bedrooms, Four bedrooms with one ensuite, oil fired central heating, front garden and gravelled rear garden. Viewing By Appointment Only. Please contact Fintan Gilligan at DNG Gilligan Auctioneers Ltd, James Street, Claremorris, Co. Mayo. Tel: 094 9371395. The AMV is €49,000. A multi block unit comprising nine residential units, a first floor commercial space (studio) and two ground floor commercial units. Part of a multi-unit development in the centre of Loughrea. All amenities are close to hand with a regular bus service. The Solicitor with carriage of sale is Mr Dario Di Murro, Woods Hogan Solicitors, Berkeley House, 17 Berkeley Street, Dublin 7. Tel: 01 8824354. The AMV is €400,000 and open viewings will take place on Saturdays from 12pm - 1pm. A fully refurnished Bar & Restaurant with a redecorated & fully fitted Nite Club. Being offered to the market with the tenants unaffected, the premises also has twelve en-suite bedrooms, a fully equipped modern kitchen, a large beer garden and ample public car parking. An excellent opportunity to acquire a top class licensed premises close to Ennis Town centre. Tenants not affected. The solicitor with carriage of sale is Mr Ronan Connolly. Connolly O'Neill Solicitors, 13 Parnell Street, Ennis, Co Clare. Tel: 065 6823577. The AMV is €275,000. Elevated site in Ballybrit with panoramic views over Galway racecourse. These lands previously had full planning permission for 54 units, planning reference (06532) in place to 4th February 2017. Of the circa 4.5 acres - circa 3.1 acres are zoned Residential with the remaining circa 1.4 acres zoned Agricultural and High Amenity. FOLIO GY101836F The AMV is €400,000 and the solicitor with carriage of sale is Ms Lorna O'Dwyer, Ronan Daly Jermyn Solicitors, Aengus House, Long Walk, Galway. Tel: 091 594777. DNG Maxwell Heaslip & Leonard are already reporting high levels of interest in their July Auctions following the first weekend of open viewings. The various properties scattered throughout the city and county kept the auction team busy with potential buyers eager for a first glimpse of the properties which will be auctioned on Friday July 24th in the Radisson Blu Hotel just before the city launches into Galway Race Week. With an excellent track record so far this year at auction, the agents are hoping to better their 95% success rate in an Auction which features a myriad of lots including owner occupier & investment residential properties, development land and commercial units in Galway, Clare, Roscommon and Sligo. Commenting on the launch, Auctioneer James Heaslip commented, “This is our fourth auctions of 2015 and we are seeing the market going from strength to strength, properties are holding their values, while purchases remain keen to purchase, well-priced properties that represent value for money. That’s what we are offering. Our phone lines have been extremely busy since we launched our auction on Thursday and we are gearing up for a very busy few weeks. We are happy to answer any queries people may have about specific properties or indeed on how the auction process works – we’ll be happy to help”. A truly exceptional detached bungalow residence in Forramoyle East close to Barna Village. Being brought to the market on an elevated secluded site of c0.55 acres with wonderful views over Galway Bay. Comprising over 120sq.mtrs of living space and in pristine condition, this bright and spacious home has many features and is being sold with the benefit of an adjoining garage, raised gardens & patio and its own private driveway. Just a five minute walk to Barna Village. Solicitor with carriage of sale: Yelverton & Co Sols, 2/3 Hartstonge Place, Upper Hartstonge Street, Limerick Tel: 061 444445. The AMV is €320,000 and open viewings will take place on Wednesdays and Saturdays from 4.30pm – 5.30pm. An exceptionally well located three bedroom duplex townhouse apartment c. 970 ft² in a modern secluded development. Close to Eyre Square, this property is in top class condition and ready for immediate occupation. Ideal for the owner occupier, the townhouse also offers the potential of an excellent rental yield. Being sold with its own private west facing balcony and much sought after residents parking. Mr Padhraic Harris, Padhraic Harris & Co Solicitors, Merchants Gate, Merchants Road, Galway. Tel: 091 562062. The AMV is €230,000 and open viewings are on Wed & Sat 1pm - 2pm, commencing Sat 27th June.